Understanding the Sun Movement, Wind flows, Materials thermal capacity, etc. of a specific site location are the very first exercises that a Sustainable Project should undertake when constructing in Lombok. Understanding the Sun Movement, Wind flows, Materials thermal capacity, etc. of a specific site location are the very first exercises that a Sustainable Project should undertake. These basic factors are key to assure a well designed passive project, in which its building physics, will not only help improve the Thermal Comfort of its occupants but also help reduce the energy loads. In Lombok in particular, these kinds of studies are important not only because the Electricity Costs can be quite expensive, but also because the Electrical Supply Grid can be sometimes un-reliable. Reducing the electrical demand through passive design doesn’t only help reduce the carbon footprint of the project, but also contributes to lower running costs whilst better quality of the space and its occupants comfort at all times, without depending on the Electrical Grid reliability. Bambook Studio can help you run the following design studies and develop passive design strategies for your project and help your architect improve its design. Orientation is essential to guarantee maximum thermal comfort whilst minimizing energy use. Different locations worldwide have very different needs regarding orientation that must be taken into consideration. Shading Studies, Solar Paths, Incident Solar Radiation, Heat Island Effect, Glare Studies, etc. Envelope design should always be the result of the Site’s Solar Studies together with the Building Function and the Occupants Needs. 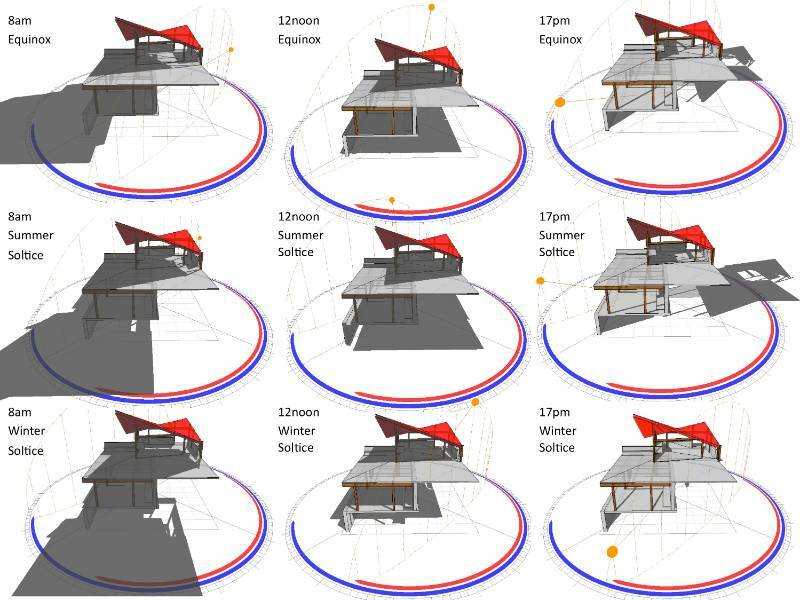 Knowing how to design a proper facade that not only responds the occupant activities but also the orientation and the Sun Movement is key to assure a good thermal comfort and optimal usage of the building. 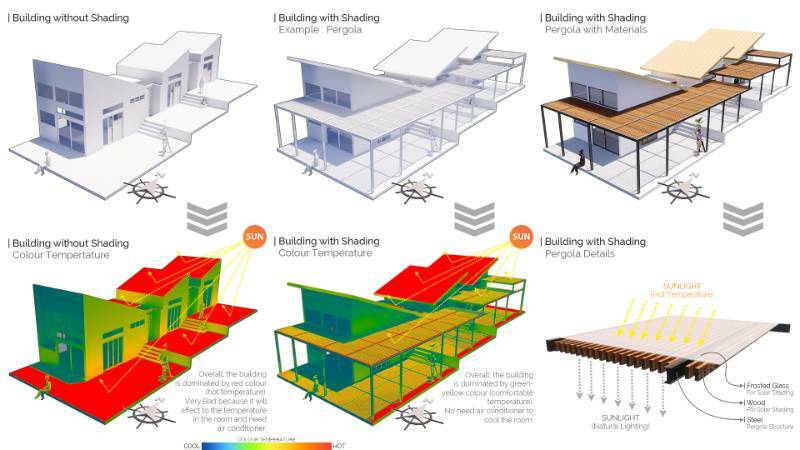 In Lombok in particular, a sustainable façade should help minimize cooling loads while maximizing air flow. Materials are the third essential element of the passive studies. Knowing its thermal properties and how they behave in different climatic scenarios is key to guaranteed comfortable microclimates for the occupants. Selecting the appropriate materials for roofing, envelope and flooring are essential to not create the HEAT ISLAND EFFECT that happens in most urban environments. Bambook Studio can help you consider different options for materials after studying its thermal mass, its albedo, SRI, thermal inertia, etc. to improve the buildings and its surroundings thermal properties. Lombok’s major challenge is a Water deficit during the long dry season each year. In particular, South Lombok is an increasingly water stressed area. The dry seasons are longer than 7 months and most projects do not have water provision at site nor from the government. Groundwater is often salty, very rich in Calcium or contaminated by Bacteria. At the current rate of development, water scarcity will be a big topic within the next 5 years. Already trucked in water is becoming a huge business with prices that are climbing steeply in this market shortfall. Bambook Studio can help you with very different water strategies to make your project more sustainable but also safer in terms of water quality and reliability. We offer strategies and solutions to reduce your fresh water demand and also to preserve water quality and treatment .. Most of fresh water provision in South Lombok comes from groundwater and is drawn from shallow wells. These often run out of water during the dry season and water quality is very variable and subject to the actions of your neighbors. Testing the water quality is essential to assess Hardness levels ( Calcium and Magnesium) that can cause numerous problems for Hot water systems and swimming pools. Testing for Bacteria and other pollutants can ensure that the water is safe for use. Bambook Studio can help you to reduce your maintenance requirements for your plumbing system and ensure that the water you use is safe and healthy. 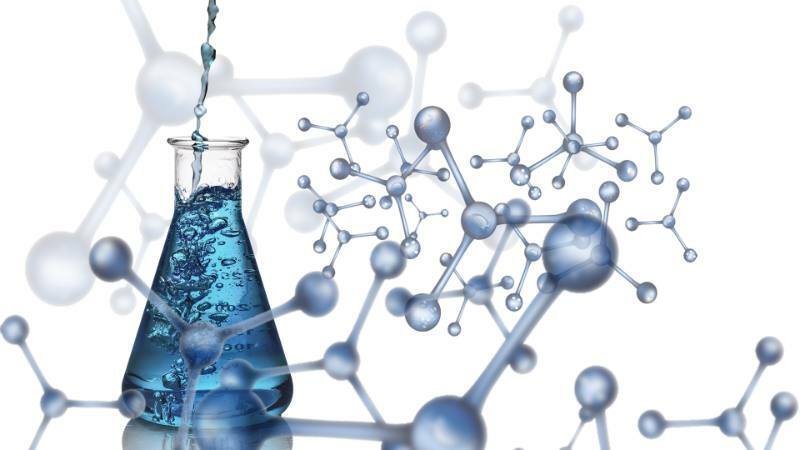 We have water tested by accredited laboratories and offer analysis and solutions. 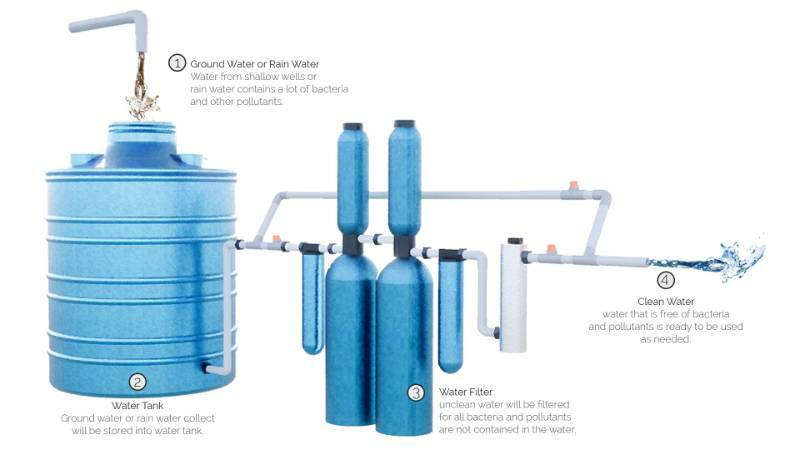 Correct selection of filtration systems will Lower maintenance in MEP installation. And prolong the life of Pipes, Pumps, faucets, appliances, etc. Lombok has a moderately high rainfall, unevenly distributed between a very wet season and a long dry season, and in the wet season it tends to arrive in heavy downpours. Access to clean water is a growing problem in Lombok with rising prices and reducing availability, a trend that will only worsen over time. 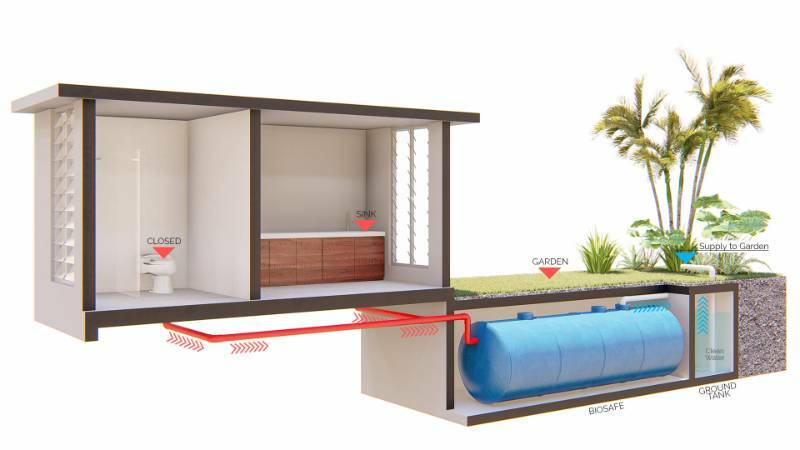 However, it is possible to attain some water security through efficient capture and storage. Instead of watching precious rainwater run to waste it can be stored and used at a later date in cost effective rainwater tanks. These can be integrated into new designs or retrofitted to existing structures. 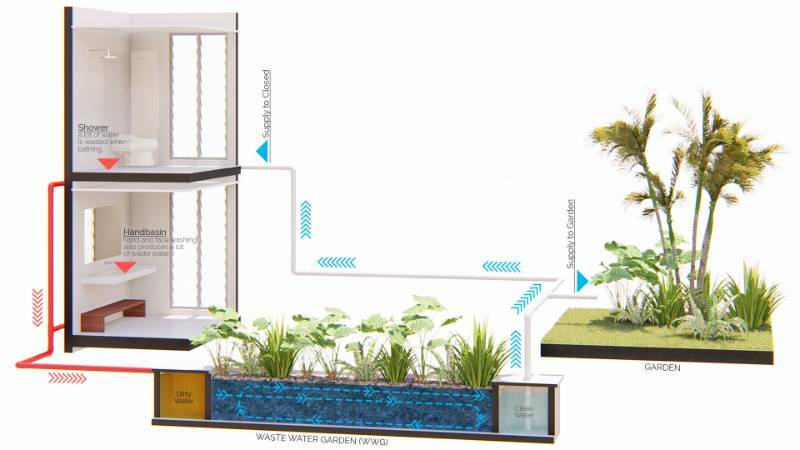 Savings from integrating rainwater use can range from 25% to 100% of annual fresh water use. Electricity and Energy Consumption from Buildings account for the largest CO2 emitter sector world wide. 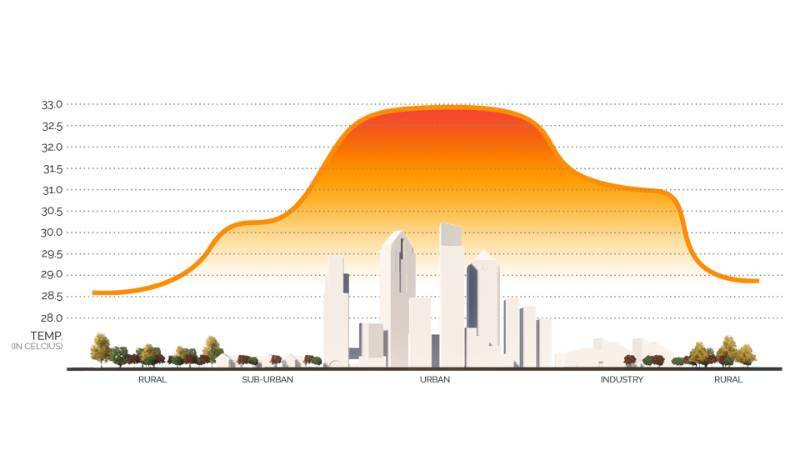 Designing to reduce energy demand is key to reduce the Carbon Footprint of our building stock. Bambook Studio is pioneer in Lombok for integrated design that achieves NET ZERO targets for any of their buildings. We work together with the key players in this area to improve and assure the lowest impact from buildings to the environment. For small to large scale, Solar Energy is nowadays the cheapest energy per watt in the planet. In Lombok, where the PLN Electrical Grid mix comes 100% from Fossil Fuels, going Solar makes total sense to reduce CO2 emissions and comply with the Paris Agreement. PLN buys solar energy from private users, which allows to have a fastest payback to the system. There are constant and recurrent power cuts through Lombok Island, which means that having a back up system is totally necessary. 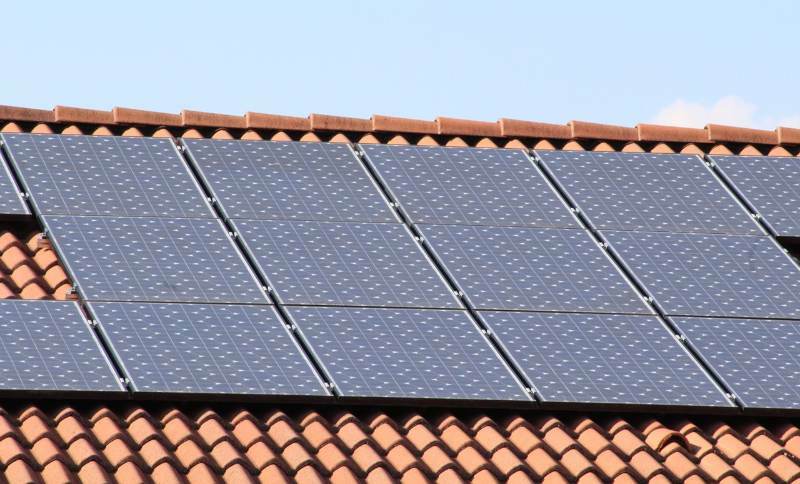 Hot Water through Solar Panels is widely use and very efficient. It helps reduce significantly the Carbon Footprint of your project by avoiding Gas or Electrical heaters. Bambook Studio can help you design, integrate and coordinate the installation of Solar Systems in your project to reduce your CO2 impact and even to achieve a NET ZERO building. A key element of sustainable design, specially in a place like Lombok with no grey/black water infrastructure or regulations, Sanitation becomes essential to assure a healthy land use for you and your neighbors. It also plays a key role in Heatlh & Wellbeing, as most of water supply in Lombok comes from underground sources. This means that black and grey water has to be treated and sorted out before disposing it into the ground. If you enjoy a longer shower, but feel guilty about overuse of limited freshwater supplies then we have a solution for you. This same water can be cleaned by attractive gardens and reused for irrigation the gardens around your property and even for flushing the toilets. While best incorporated during the design phase, they can also be retrofitted to existing properties. If you would like to save water costs and reduce wastage, then we can help you. Organic materials from the Gardens and Kitchen presents a disposal problem in Lombok. Instead of becoming garbage or being burnt there are simple systems that can benefit you. We can assist and install systems ranging from the very simple home solutions to more sophisticated technology. 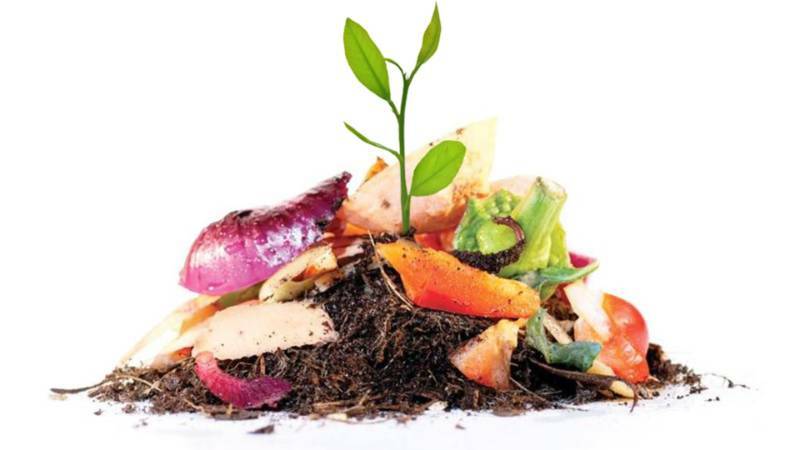 The outcome will be a natural compost that will reduce your gardens water needs and increase the health of your plants. Water from toilets, kitchen. pools and laundry can be safely treated and reused to enhance your landscape, this will improve your gardens health and greatly reduce your freshwater use in the landscape. Landscape is a very important part of your investment. How you treat the land around your buildings has huge impacts to the Aesthetics and the health of your land and your neighbor’s’. On top of that, if a planting pattern that is unsuitable for the location is used then it can cost a lot in maintenance and in use of limited supplies of freshwater. Bambook Studio has specialized in designs that match the most suitable plants to the area and in using clever placement of vegetation to reduce maintenance and enhance the eco aspects of the buildings, through shading and shelter to soil improvement and erosion control among others. For small and large scale, landscape design is key to assure a Sustainable Project. 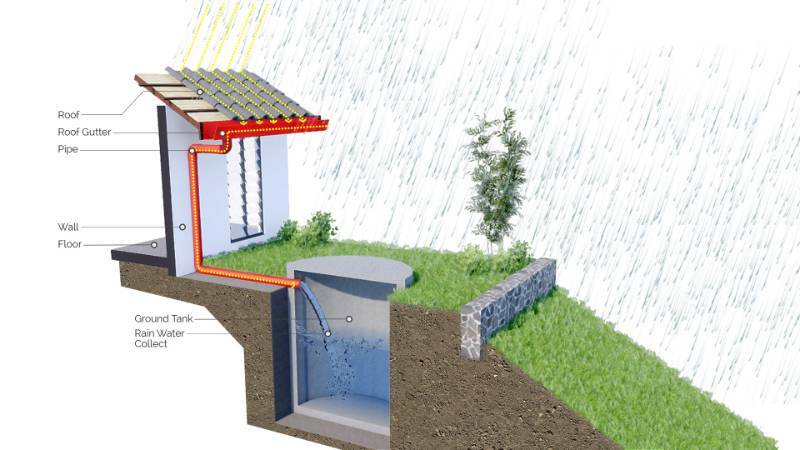 It must include the proper elements to assure the health of the soil around you, improve the quality of the underground water resources and contribute to the Sustainable Passive Design through shading, shelter and other benefits. Rain Garden & Swales, Green Roofs, Dust & Noise Control Landscape Barriers, Adult Tree transplanting, Reforestation and Bioremediation, Erosion Control, etc.